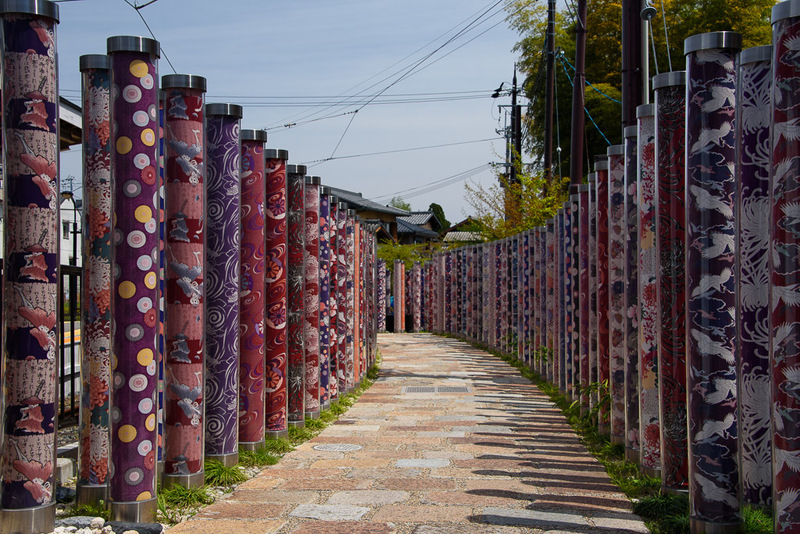 Arashiyama (嵐山) is a pleasant, touristy district in the western outskirts of Kyoto. The area has been a popular destination since the Heian Period (794-1185), when nobles would enjoy its natural setting. The area is particularly popular during the cherry blossom and fall colour seasons. The Togetsukyo Bridge is Arashiyama’s well known, central landmark. Many small shops, restaurants and other attractions are found nearby, including a number of temples and Arashiyama’s famous bamboo groves. The Togetsukyo Bridge (literally “Moon Crossing Bridge”) is Arashiyama’s most iconic landmark. It was originally built during the Heian Period (794-1185) and most recently reconstructed in the 1930s. The bridge looks particularly attractive in combination with the forested mountainside in the background. A riverside park with dozens of cherry trees is located just adjacent to the bridge. Unfortunately the blossoms were all gone by the time we were visiting. This panorama encompassing a view which spans both directions on the bridge was taken near the middle of the walk across. Here it is presented as a stitched panorama consisting of thirteen (13) vertical frames taken handheld.